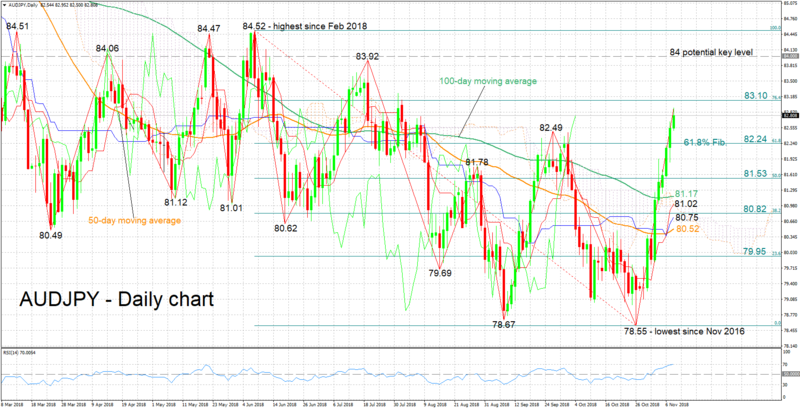 AUDJPY staged a remarkable comeback after hitting a two-year nadir of 78.55 in late October. The pair currently trades more than 400 pips above the aforementioned low, while it rose to a three-month high of 82.95 earlier on Thursday. The Tenkan- and Kijun-sen lines are positively aligned in support of a positive short-term bias. The RSI, which continues to rise in bullish territory, also lends credence to the bullish view. At marginally above 70 though, the indicator has entered overbought territory. The implication is that a near-term correction may be on the horizon. Stronger advances may meet resistance around 83.10, the 76.4% Fibonacci retracement level of the downleg from 84.52 to 78.55. Further above, the area around the 84 round figure, which captures a couple of peaks from previous months at 83.92 and 84.06, would be eyed. Higher still, a strong barrier may come around the pair’s highest since February at 84.52; notice that the zone around this top halted gains on two more occasions in the past. On the downside, support could come around the 61.8% Fibonacci mark at 82.24; late September’s top at 82.49 lies in proximity to this point. Even lower, additional support could occur around the 50% Fibonacci level at 81.53. The recent advances – AUDJPY looks set to post its sixth straight day of gains – have managed to shift the medium-term outlook towards a predominantly bullish one. Supporting this, is price action taking place above the 50- and 100-day moving average lines, as well as above the Ichimoku cloud. Overall, both the short- and medium-term pictures look bullish at the moment, but there are some sings for a possibly overextended rally in the near-term.